A harpist from the Isle of Man said she was "surprised and overwhelmed" to win a prestigious annual folk music award. 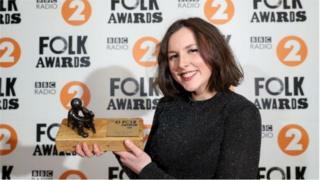 Mera Royle, from Maughold, was named as the winner of BBC Radio 2's Young Folk Award at a ceremony in Belfast. The 18-year-old A-Level student, who also plays the violin and penny whistle, has been playing the harp for about nine years. She said the award has already opened doors, bringing in invitations to play at festivals during the summer. She added: "I have to get through my exams first - I'm in my final year of A-levels and the exams start in May so I will have to buckle down and get some revision done next." Ms Royle, currently a student at Ramsey Grammar School, learnt to play the penny whistle in primary school where she was a member of the folk group. She then went on to have violin and harp lessons. "I'm really grateful for all the help I've had over the years, especially from my music teachers," continued Ms Royle. The BBC Radio 2 Young Folk Award is an educational contest which aims to discover the next generation of folk acts. Two other Manx musicians were successful at the awards. Adam Rhodes and Tomas Callister are members of Ímar, a five-piece band based in Glasgow who won the Horizon award.